We recommend checking out our discussion threads on the Corel Photo Video Suite X7 (Download) ESDPVSX7ML, which address similar problems with connecting and setting up Photo Software Corel. The user manual for the Corel Photo Video Suite X7 (Download) ESDPVSX7ML provides necessary instructions for the proper use of the product Computers & Solutions - Software & Tutorials - Photo Software. Combining advanced still image and video editing programs, this Photo Video Suite X7 from Corel pairs both PaintShop Pro X7 photo editing software and VideoStudio Pro X7 video editing software to provide an overall solution for an efficient all-around digital imaging workflow. Both programs revolve around highly customizable and intuitive interface designs and offer support for an extensive range of input and output file types as well as an array of sharing options. Suited to the multimedia user, these configurable editing applications provide a comfortable means for editing both still images and movies in a unique and powerful way. PaintShop Pro X7 champions the ability to retouch and make image adjustments in order to produce resolved, finalized photographs that are ready for sharing or outputting in a variety of mediums. Both automated and completely manual control over the look and feel of imagery is supported in a friendly environment with the option to work in a layered, non-destructive manner. A Magic Fill tool utilizes content-aware technology for intelligent retouching capabilities while updated brushes and selection tools offer greater refinement for more precise editing. Support for RAW file formats offers extended editing control and the ability to utilize a scripting engine allows you to program oft-used controls and sequences for a more automated method of working. Similarly, VideoStudio Pro X7 is an advanced video editing tool that allows for complete control over movies from start to finish. Support for Ultra HD 4K video files and the ability to utilize animations and other multimedia source files helps to round out the range of control over producing dynamic movies or slideshows. Video editing can be controlled in either advanced or simplified methods using either the detailed multitrack interface or the more visibly-friendly storyboard method; both of which can be used with drag-and-drop ease for adjusting all visceral components of a well-rounded production. If you own a Corel photo software and have a user manual in electronic form, you can upload it to this website using the link on the right side of the screen. The user manual for the Corel Photo Video Suite X7 (Download) ESDPVSX7ML can be downloaded in .pdf format if it did not come with your new photo software, although the seller is required to supply one. It is also quite common that customers throw out the user manual with the box, or put the CD away somewhere and then can’t find it. That’s why we and other Corel users keep a unique electronic library for Corel photo softwares, where you can use our link to download the user manual for the Corel Photo Video Suite X7 (Download) ESDPVSX7ML. 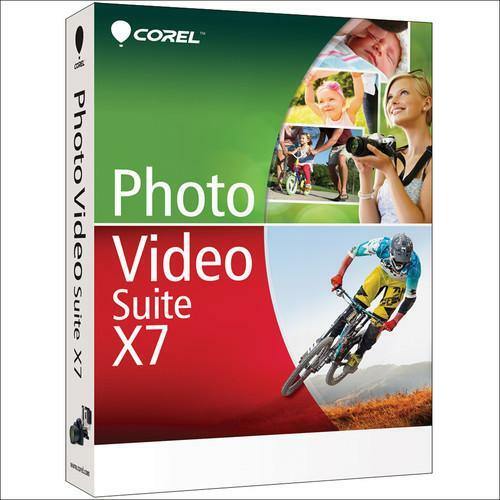 The user manual lists all of the functions of the Corel Photo Video Suite X7 (Download) ESDPVSX7ML, all the basic and advanced features and tells you how to use the photo software. The manual also provides troubleshooting for common problems. Even greater detail is provided by the service manual, which is not typically shipped with the product, but which can often be downloaded from Corel service. If you want to help expand our database, you can upload a link to this website to download a user manual or service manual, ideally in .pdf format. These pages are created by you – users of the Corel Photo Video Suite X7 (Download) ESDPVSX7ML. User manuals are also available on the Corel website under Computers & Solutions - Software & Tutorials - Photo Software.